Downloadable Inflation, or Gold Standard? Inflation, or Gold Standard? 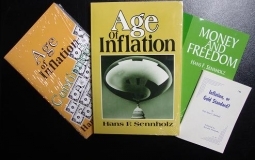 details the perils of inflation, ranging from government control of money and the role of the central bank to redistribution of income and wealth, and booms and busts. Sennholz then contrasts the merits of the gold standard, beginning with the historical perspective, showing how a standard without government interference brings economic stability, and giving a roadmap for a return to the Gold Standard.